What to work on Wednesday? Second session of open shop proved to be a day full of thought and planning. Encouraged to create projects that fill their own desire but at the same time fit within the constrains of our shop and under 20 working hours, as collaborators we emphasize the importance of the design phase. 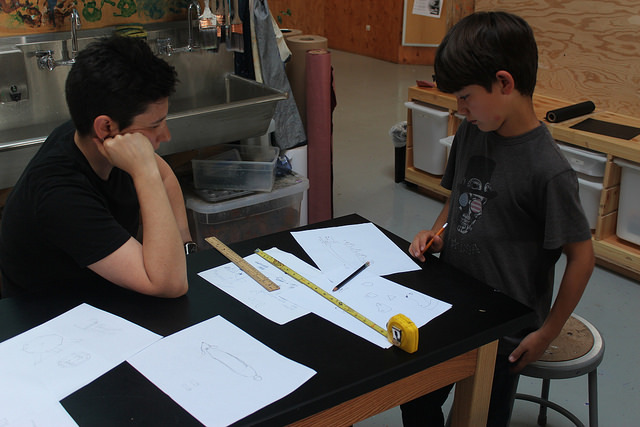 Planning and sketching out our ideas encourages builders to explore ideas on material use, size and even functioning mechanics. Armed with this sort of information we try our best to lay out a foundation to follow before beginning to build. This enables us to approach the project work with a clear direction. We worked through many of these obstacles, on our second day (you'd be surprised how hard it can be to focus on designing when there is a shop busting with tools you want to use just around the conner. It seemed our questions about the designs only resulted in a spike in both imagination and the amount of time one could commit to planning. We learned the more complex the project the more detail there was to explore before we were ready to begin. We end the day with some time to begin building! We take time to learn about tools that aren't coved in basic training.